As the title said, I want to share my tips and tricks on donning a vintage outfit that is wearable and will get a nod from your grandma. I am not an expert and do let me know if you find some fact mistakes. I will fix it as soon as possible! 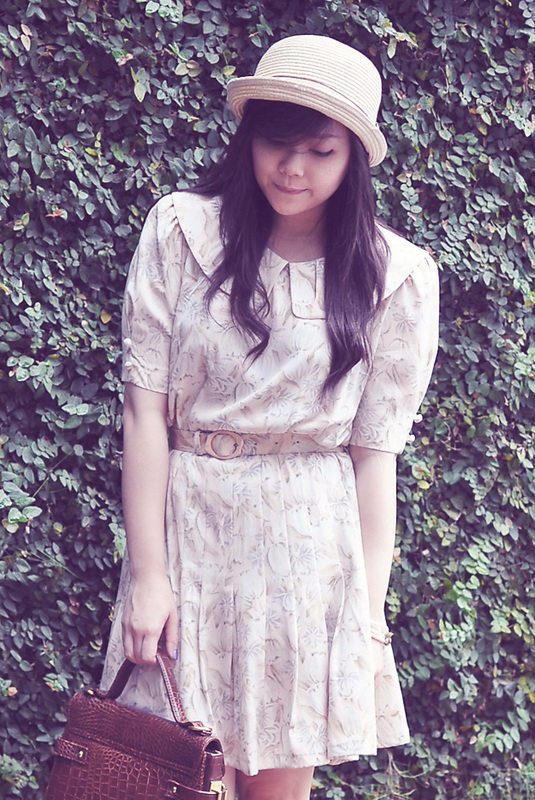 The first thing to know, vintage means the year of 1920s-1950s. After that, until the 1990s is called retro. Here I will give an example of adapting 1940s dressing into reality. 1) Tea dresses. Here is an example of a great 1980s tea dress that is in crisp condition. With the exact same belt! Which is rarely happened. It usually the first one that's gone missing. Tea dresses are the first one that pops into mind when thinking about the women in the 1940s. Floral and polkadots are the easiest to find. This dress was originally a calf length but I cut it to my preferred length. 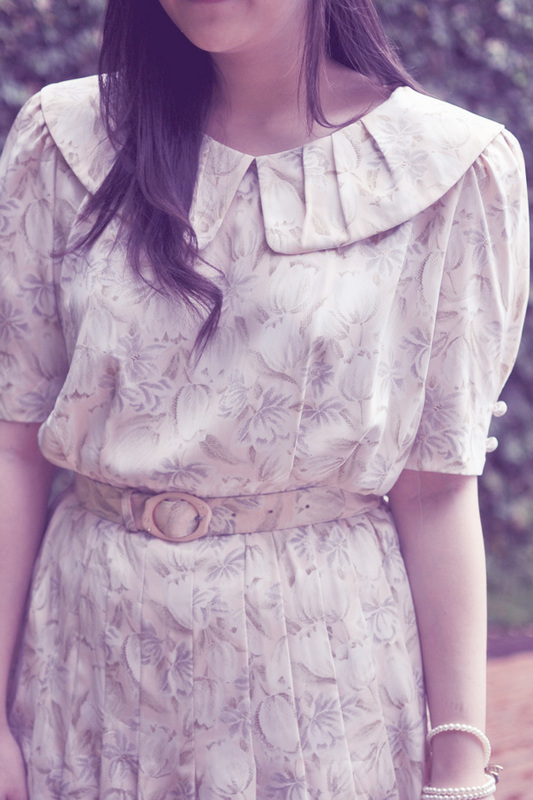 1980s dresses are very similar in styling with the 1940s. Plus, it's much easier to find. You would want to look for a dress with a shoulder pads cause those are the period of World War II and clothing are looking more and more similar with uniform, hence the shoulder pad. However, the war time also means looking good for the brave soldiers. So all the women feminity are put on display. Note the accentuated waist and the wide lapel (collar) brings attention to your lovely kissable neck. Also, the flare skirt that will easily shows some skin when the wind blows! 2) The hat. Hat is very important for women back in the 1940s. A respectable woman never leaves her house without a hat and a pair of gloves. In my opinion, we can loose the gloves as it is hard to find and it will look too costume-y, at least for me. 1940s are the year of make and mend since everybody is busy battling war, nothing can go to waste. Hence, the hats are variant but the most popular choice is the beret hat. Here, I wore my woven hat which has a slightly "bowler hat" style that makes it more current. 3) A boxy bag. Bags are also very wide in variant but mostly are small enough just to put in your powder, your gloves, and your wallet. No phones or portable charger needed! Here I bought my alligator (was also a trend in the 1940s) boxy bag just two years ago and it has been a favorite that ironically, makes it rarely see the daylight. 4) Low heeled shoes. Remember, it was the time of war and women were taking over the field work. They need practical footwear to be worn all day long while doing all those chores. No stiletto heels here. The heels are also usually very sturdy and square. Mine is perfect to walk in all day long. The floral pattern is a bit too much, but I couldn't help myself! The shoes were just calling to be taken home. 5) A brooch. I don't own any and I am now on the hunt on finding one! Brooch are very popular in 1940s. Most brooches are inspired with war-theme. Such as a jet planes. Flowers tho, are always in trend. They usually pinned it in the wide lapel or on the side of the chest. 6) Matchy matchy. Yes, they love wearing everything in syncronhize! They usually go with two colors and just mix and match around them. No clashing colors or clashing prints just yet! your bag and shoes are so lovely!! you look so adorable and doll like! great hat! What an array of helpful tips, thanks so much! Your look so pretty by the way! This look is just so perfect! you do have a research before you post this outfit, don't you? and your outfit just so vintage! This is definitely the cutest outfit ever! I love it :)! I love your vintage look and the vintage vibe of your photos! And your shoes! grh! I want that! thanks for the tips kak! Aww, I'm in love with your shoes. 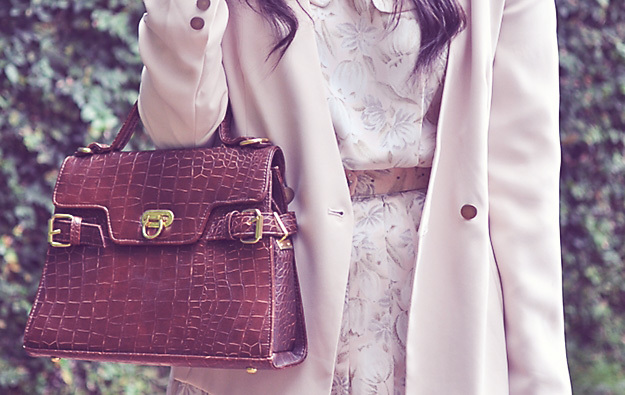 and the blazer, even if it oversized blazer, it's really match with your dress! Such a gorgeous gorgeous dress - love the soft colors! This is such a lovely and soft look :) You are so gorgeous lady! 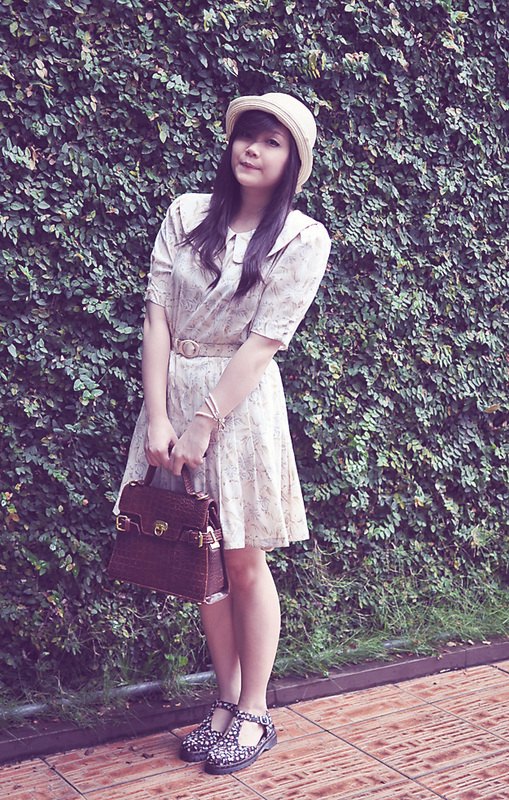 i love the little matching belt, that definitely helps with the vintage look if you can a dress and belt set together. except the 80s means a very big exageration on those 40s shoulder pads haha! I have a few 80s dresses I need to put a sitch in the shoulders because they're too silly but this one look perfect i def wouldve thought it was from the 40s if you hadn't mentioned it. I LOVE your stylign here, I'd never thought to pick out this dress but you look gorgeous in it & styled it perfectly, great job!